Two young girls, Satsuki and her younger sister Mei, move into a house in the country with their father to be closer to their hospitalized mother. Satsuki and Mei discover a nearby forest, inhabited by magical creatures. They befriend these creatures, and are soon embarking on magical adventures with them. With the release of My Neighbor Totoro, Hayao Miyazaki and his team at Japan’s leading animation studio, “Studio Ghibli” were launched into the league of master filmmakers. 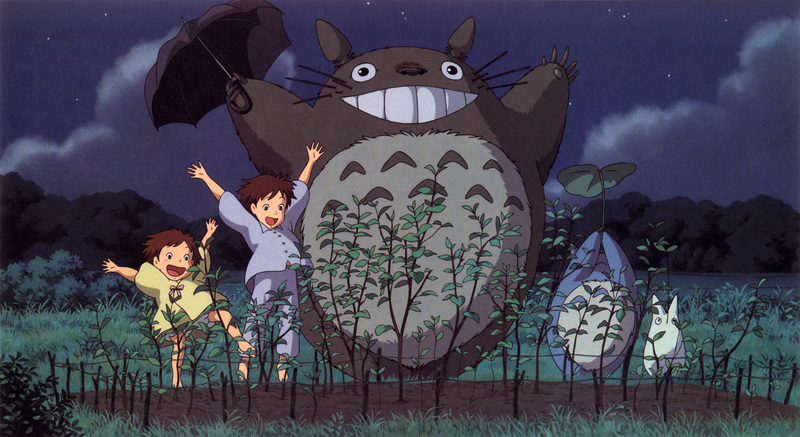 My Neighbor Totoro is a delightful film, filled with a love not just for animation, but also for the art of filmmaking. And that is exactly what the film is, a true work of artistry. The film is an innocent and sweet creation, filled with a kindness that only the imagination of a child could ever project. To see My Neighbor Totoro is to be sent to a world of no evil, little sadness, and beautiful images of aggrandised fantasies. The film’s world is mostly projected through the eyes of two sisters. Satsuki, being the elder of them, must take care of and guide her younger sister, Mei. Mei is an impetuous and often overly excited young girl. She represents a feeling of true enrichment and passion for imagination and creativity, which is felt strongly throughout the film. If Mei is the feeling of child joy and freedom of creative expression, Satsuki is often reflected as a transformative loss of innocence shown in a result of growing older and gaining larger responsibility. This is felt strongly in many sequences sprouting from Mei becoming lost or upset. In absence of their father at times, Satsuki must embrace a sense of authority and adulthood, often having to absorb any problems that Mei may face. In turn, trying to deal with both of their anxieties. These anxieties arise from one main source in the film, (and may essentially be the films under foundation) the health and welfare of Satsuki and Mei’s mother, who is hospitalised with illness. The girls move to a new home with their playful and kind-hearted father, who cares for the girls while working as a college professor. He is a noble man, and tries his best, but struggles to handle his work with caring for the girls, often resulting in large stretches of his absence. Because of this, Satsuki and Mei are at times left to freely explore the world of forest that lives beside their new house, and they do so in an extremely intrepid manner. 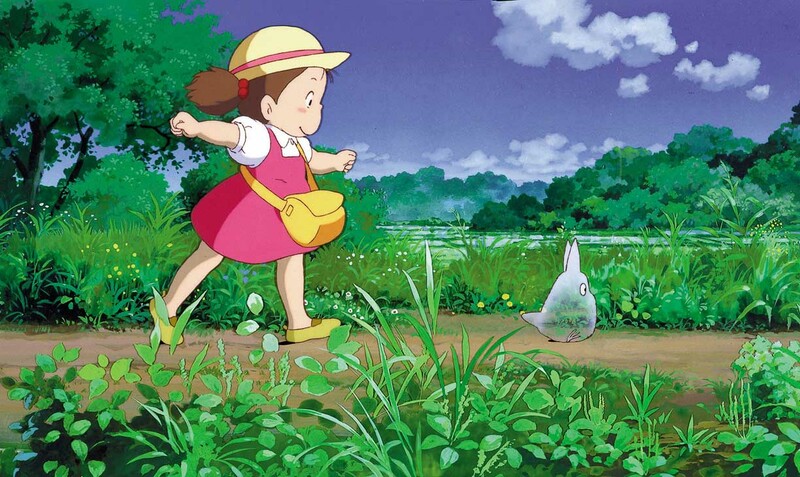 It is here in which the girls meet title character Totoro, and his two smaller friends. Totoro is an immensely friendly creature with an innocent and clumsy nature; he is soft and furry with peaceful eyes and long cat-like whiskers. The very nature he encapsulates could mollify the most difficult of situations. The film never falls one way or the other when exploring Totoro’s true existence. Instead, he is left purely to the imagination of Satsuki and Mei. Whenever they are in need or require helpful encouragement, Totoro will be there for them. 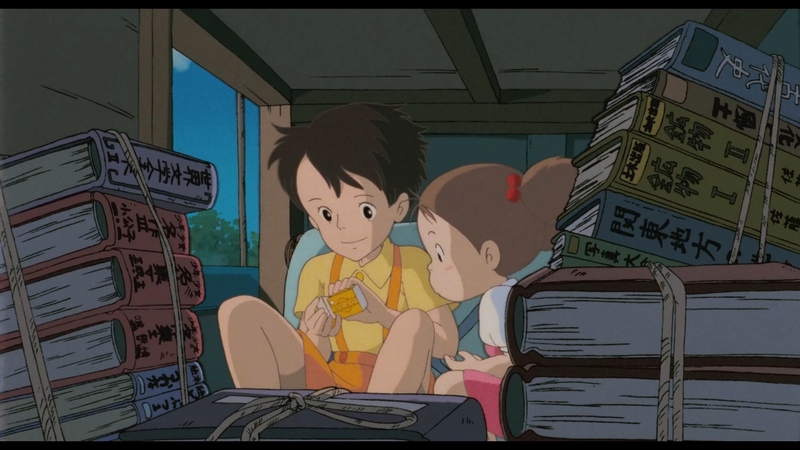 In one beautifully animated scene, we see Satsuki and Mei waiting for their father at a bus-stop. 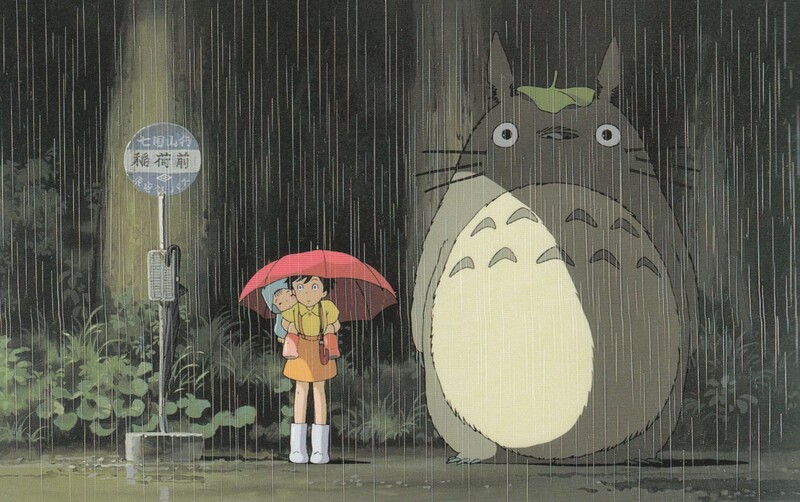 After waiting for what seems to be all evening, they are joined by Totoro, who stands beside them in the rain. His cheerful presence immediately lights up the scene. The boring and lingering situation quickly becomes an adventure. Totoro becomes available to the girls whenever they are in need of a smile. And, whether he is a figment of their imaginations or not, he truly helps them overcome. Totoro makes an exit at the end of this bus-stop scene in perhaps the finest and most bizarre animated character ever invented – a giant cat, shaped as a bus, complete with holes for windows, a changing route destination sign, and a call so loud it shakes the entire forest. It is subtly suggested in the film that these wonderful creature creations are only present in the minds of Satsuki and Mei. This would be perfectly plausible not only because these are two adventurous and free-spirited young people, but because Totoro to them seems to fill an emotional gap, left wide open and vulnerable due to their mother being very sick. Totoro and his friend do all they can to support the girls through this, providing them with magical adventures and wondrous fantasy. At one point even handing out seeds to the girls, helping them to spontaneously grown these small seeds into a ginormous tree. Of which we see has mysteriously disappeared the very next day. My Neighbour Totoro is one of the warmest films you could ever see. This is evoked not only through its story, but also through its undoubtedly wonderful animation. Miyazaki creates a colourful and vibrant place where anything is possible. The film’s music is playful and at times childish in the best possible way. Its pop-like melodies blend with the films curious world, to create a handcrafted landscape that invites and indulges. The world is not without pain and loss, but you can rest assure that within it, a kind hand will never be far away. 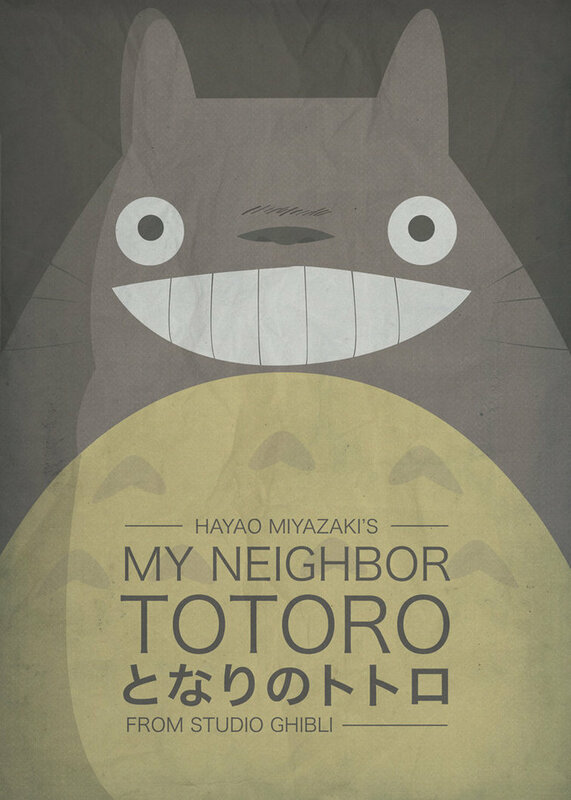 My Neighbour Totoro is a film to be enjoyed with others. Even the most obdurate among us may fall for its unique charm. The film is home to several bizarre and wonderful creatures, and some touchingly well-crafted characters. Satsuki and Mei face the facts of growing up, but they do so with a friendly spirited Totoro by their sides, and who in this world wouldn’t ever want that. One of the really great animations from Japan. I do prefer ‘Princess Mononoke’, and ‘Nausicaa of the Valley Of The Winds’ though their subject matter is very different. Marvellous stuff Darrell, and deserving of praise. We had friends over to visit with a very young child. They brought their own Disney movie but I insisted on MNT. She was entranced and her parents couldn’t believe how she responded to it. I have loved every single Miyazaki film I’ve ever watched, but I haven’t seen this one. Thanks for the reminder that there are still Miyazaki films that I haven’t yet discovered! We own this and several others. The genius of Hayao Miyazaki and Studio Ghibli goes above and beyond expectations. If you have not seen this yet, I definitely recommend a family movie night soon. My son is in high school and we still love watching all of their anime’s. This is my personal fave from Miyazaki! Totoro is cute and its so fun to watch and touching as well. The music is lovely and hopeful! Total awesomeness! 🙂 Great review! Excellent review. My siblings and I watched this film as children and it is definitely a one-of-a-kind film. I never realized until now (thanks to this review) that Totoro and his friends filled the girls’ emotional needs. I guess as a child I just enjoyed the happiness of it all. Again, excellent review!